The extras arent extra at drury hotels. Your Great rate includes free hot food and cold Beverages at our 5.30 kickback/ free hot Breakfast/ free wireless internet access and Free long distance. Our 5.30 kickback includes A rotating menu of chicken tenders/ meatballs/ Baked potatoes/ soup/ salad/ beer/ wine/ soda / mixed drinks and more -subject to state and Local laws-. Dont miss our great free hot Breakfast buffet with sausage/ belgian waffles/ Biscuits and gravy/ fresh fruit/ bagels/ and Pastries. Take advantage of free popcorn and Soda every evening from 3-10 p.m. As well as Our complimentary exercise room/ and 24 Hour business center. Come stay with us in San antonio. 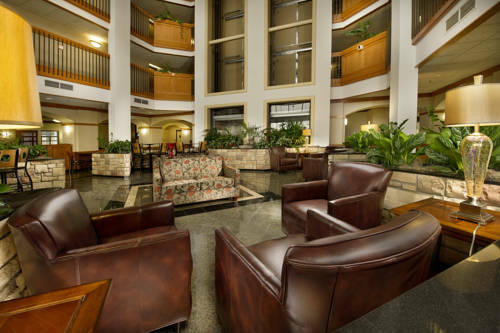 Conveniently located only miles From the airport and all san antonio attractions. This hotel offers 210 standard guestrooms and Two-room suites. The suites provide a relaxing Atmosphere/ which include separate living and Bedroom areas. Our focus is ensuring that our Guests get more for their dollar than at our Competitors family ownership makes drury Hotels distinctly different by providing a Consistent experience at more than 130 hotels. For eleven consecutive years j.d. Power has Recognized drury hotels with the award for Highest in guest satisfaction among mid-scale Hotel chains. Come stay with family At drury hotels. Awards 3 diamond AAA rated. Our Free Hot breakfast buffet includes sausage/biscuits and gravy/waffles and more. Our 5.30 Kickback includes a rotating menu of chicken tenders/meatballs/hot dogs/wings/beer/ wine/soda/and more -subject to state and local laws-. I-10 AND WURZBACH. LOCATED JUST MINUTES FROM THE SOUTH TEXAS MEDICAL CENTER AND THE UT HEALTH SCIENCE CENTER. A GREAT CENTRAL LOCATION TO THE ALAMO..FIESTA TEXAS..SEA WORLD AND NUMEROUS CORPORATIONS. CONVENIENT TO SHOPPING AND DINING.